I fell in love with the idea of raised bed gardening when I quickly learned how unreliable city soil can be. This video is all about getting you started with raised beds, including how to build your own. I will also demonstrate how to build a hoop house. The raised bed that you’ll see me building here only cost me $40. My raised beds are built, based on four foot beds and eight foot beds which happen to be the general measurement standard for lumber, which makes it easier. Let me share with you some of the reasons for my love of this method of gardening. I'm here with my friend William Moss, who is going to give us a quick lesson on how to prepare a raised bed for planting. We have all we need; a good location with about 6-8 hours of sunlight, and a raised bed that needs to be cleared out and prepared for the next planting season. The first thing to do, especially if you are working in a raised bed that was used last season is to remove last year's debris. Never fear, the "debris" will not go to waste. It will go right into my compost bin. It’s time to start getting the cold weather crops into the ground so today, I am joined by my friend, William Moss and we are talking about sowing seeds in a raised bed garden. See how simple it is to usher in a bountiful harvest. We are planting lettuce, radishes, Asian Greens and onions. Onions do take a while so we need to get them in the ground now. Have you ever heard of lingonberries? Most likely, not. But if you know anything about Sweden or you’ve shopped at IKEA, you’ve at least heard them mentioned. Let me tell you what they are. The lingonberry is a hardy perennial evergreen shrub, closely related to blueberries and cranberries. They can be found in forests in northern Europe, Northern America and Canada. They are a small tasty berry that is a mainstay of Swedish cuisine. In Sweden and other parts of Europe, lingonberries are used in every thing imaginable, including wines, liqueurs, soda, jelly, jam, Swedish pancakes, sauces for with meats and fish dishes and any other time that blueberries or cranberries are used. The unique tartness of lingonberries offer a whole new dimension to traditional dishes. Here are some of the reasons why I love cherries! 1) Cherries contain antioxidants that help reduce inflammation and pain as well as help fight chronic illnesses such as reducing cholesterol; 2) Cherries make a great snack and 3) Cherry blossoms signal spring! My new cherry trees have just arrived and in this video you will see how I prepare them to be planted in a container. You will see that these trees look different from the ones that you are used to seeing me work with. These are brand new bare root trees which means they have to be prepared for a container, differently than other already potted plants. Did you even know that it’s possible to plant trees in a container? Let me show you how. There are so many uses for grapes. Fresh grapes make a healthy fruit snack eaten by the bunch and it’s a great addition to a fruit salad. You can also make delicious jams and jellies and can them to enjoy all winter. I’m so excited! They’re finally here! My Sweet Lace Grapes that will grow beautifully in my patio container garden. If you are not familiar with this type of grape, I’ll show you. Sweet Lace grapes are different than the other types of grapes that I grow. The Sweet Lace plants are slightly more delicate with a lacey ruffle in their foliage. I thought it would be nice to learn how to properly plant a tree. So, I asked my friend, arborist, Gary Overton, to help me show you how to plant a tree, the right way. This is something anyone can learn. The best time to plant a tree is the spring or fall. Fall is usually even better than spring because in most places temperatures are moderate and there is plenty of rain. The only type of tree that I don’t already have in my garden is a Japanese Maple – so today that is what Gary and I are going to plant. This is your lucky day. I am going to give you a 5 minute lesson that will change your life and the life of your trees. I am joined by my friend, Gary Overton, an arborist, who is helping me prune my very large plum tree while teaching us all to prune properly. Gary explains that the main thing you want to do when pruning a tree is to eliminate the water spouts (some call them “suckers.” These small little sprouts can’t produce fruit. By removing them it allows the trees to deposit their nutrients in places where it will count. My mouth is watering thinking about all of the delicious things I can make with blueberries; Pie, Grunt, Jelly, muffins, Pancakes, Smoothies, Bars and cereal...And they’re good for you! New England (zones 4-7) is the best area for blueberries to thrive. What’s great about these healthful anti-oxidant-rich berry is that they are durable and versatile and can grow in lots of other zones, as well. You can plant blueberries in the spring, but they’re also excellent to plant in the fall. Planting blueberries doesn’t take much work. Find a place to plant your blueberries where they will receive full sun at least 6-8 hours a day. If you are in more of an urban environment they grow well in clay or rocky soil, too! Americans think big! And our obsession with all things big has to change for the good of the earth. Large lawns were once meant to symbolize status. Back in the day, large lawns earned their reputation with good reason. Historically, a large “lawn” meant that there were plenty of sheep and cattle grazing on the land. That is usually not the case when driving through any town USA these days. Today’s large lawns only mean one thing: Waste! Large lawns waste acres of usable real estate, use tons of water and maintaining them create noise and air pollution. Additionally, the pesticides needed to keep grass alive, poisons our soil, sewers, and ground water with harmful pesticides and petro-chemicals. In this video, I am going to take you on a little tour through my city apple orchard.You will see that I have planted Semi Dwarf and Dwarf trees and they are Red Delicious Apples and Cortland Apples.Both of these varieties are excellent for cooking but the Cortland apples are slightly tarter, making them perfect for salads. The most important thing to remember about growing apples is that they take a few years before they fruit. These orchards that we are walking through are the result of work that I did nearly two years ago. So be patient! Welcome to my Grape Arbor Trellis. Here you’ll see me training my grapes to grow upward on the trellis. I am using jute twine which is an organic material that complements the look of my garden. Because it’s natural it will eventually decay – but by the time that happens, my grapes will have already taken hold of my arbor. As I attach the grapes, I do it loosely because the sun and rain will cause the jute to shrink. By giving the jute ample length in between each attachment, it allows the grapes and the jute to do what they do, without hampering the process. The corn serves as a pole for your beans to climb. Corn requires nitrogen to grow; Beans absorb nitrogen from the air and convert it to a form that other plants like corn can use. The beans climb up the corn stalk an provide extra rigidity preventing the corn stalk from falling down during wind or rain. The squash balances it out providing shade; keeping weeds down and moisture in the soil. What’s the big deal with planting seeds? Seems simple enough…Just put your seeds in the dirt, water and hope. Or, you can do it the right way and have exactly what you want: germinating seeds, glorious plants and perfectly grown organic vegetables. Weed control has been an issue for gardener’s going back thousands of years and one of the things that bedeviled me in my early gardening years. Let’s face it, weeding is pain, it can be back breaking, ruin the “look” of your garden and rob your plants of needed sunlight, water and nutrients. But a few years back I learned that weeds are essentially missed placed plants, they are kind of like teenagers, they just want food, shelter and a place to reproduce and your garden is a wonderful place for them to do that. As an organic gardener your goal isn’t complete eradication, if it is you’re probably reading the wrong magazine, the goal is, like with teenagers, control and I find that there are three major steps in controlling your weeds. The most important thing is proper set up and preparation. If you take the time to set up your garden properly you can reduce your time in maintenance, by almost 70%. The simplest thing you can do, weather you garden rows or in raised beds like I do is provide an actual physical barrier to keep those pesky weeds in check. Welcome to "no-excuse gardening." In just 30 short minutes you can have a vegetable garden, which will be an excellent first project if you are new to gardening. If you are a seasoned gardener, using Garden Soxx is just the perfect way to start something new, without wasting too much time or effort in the process. Garden Soxx, which were originally designed for erosion control, have also become a new way to plant in small spaces, which makes them perfect for raised bed gardening. Garden Soxx are cleverly made from a synthetic fabric which is stuffed with 1 cubic foot of compost, and will last from 3-5 years. There are no limits to what you can do, if you just think outside the box. The urban gardener’s biggest challenge is space, but that never stops me and it shouldn’t stop you, either. If you haven’t already noticed, I have a soft spot in my heart and stomach for Italian Food. Why, Garden Girl, you ask? Because, it’s so easy to make; there are endless possibilities and it is always delicious. Italian Food has always been my family’s favorite, but once I started gardening and preparing my sauces with fresh grown herbs and vegetables, they can’t seem to get enough of the stuff! Just wait until you try it on your family. This video is part two of my Native American Three Sisters Garden video series. The Iroquois Native Americans were really on to something! In their tradition, every single year, I plant a Three Sisters Garden and watch in awe as it thrives. This easy-to-plant garden is the epitome of “nature taking its course.” Amazingly, like three siblings, the plants interact with each other in a complementary nurturing fashion; protecting each other from the elements. The three sisters are corn, beans, and squash and they fit beautifully in a raised bed. After only four weeks, this video shows me harvesting beans from the garden with my daughter, Alejandra. She's always a big help at harvest time. Believe it or not, it is winter, and you will find me in my garden - still! And I am going to show you how your garden can still thrive in the winter. Raised Bed gardening makes it all possible, by extending the possibilities for your growing season. The keys to winter gardening are having the proper seeds and the proper environment. By creating a micro-climate you can create a warmer environment than what is actually outside. The goal is to raise the temperature in your micro-climate to somewhere between 35 and 55 degrees Fahrenheit. The early bird gets the worm and a whole lot more! My early spring planning has paid off. With my use of hoop houses, I was able to plant two weeks before the last frost and now I already have some edibles! This particular raised bed is a companion bed filled with several different things that all work together. This bed contains sunflowers, two rows of eggplants, cucumbers growing on a trellis, basil, marigolds, Mesclun salad, potatoes and finally corn and beans (Think Three Sisters). In New England, where I live, we have a short growing season. My Hardiness zone is 6 which means the Avereage low temperatures fall between 0°F through -10°F and in Boston my growing season is only 6 months out of the year. Extending my growing season is necessary for me. I create micro climates around my raised beds with the hoop houses. As long as the temperature around the plants stays around 55°F, cool weather crops like lettuces, cabbages, and Asian greens can grow. Watermelons are vining crops. Large vining crops – but don’t let their size intimidate you. (Watermelons can grow from 1 to 250 pounds!) City gardeners are still in the game. You, too, can grow watermelons on vines in a small space for the same refreshing result. This short clip shows you how I use a version of a sandwich bag tie – these come in a roll and you can choose the length you want – to attach your plants to the upright support. You should attach your stems in several different places along the trellis and train them to weave through at the top. Watermelons take anywhere from 60 to 120 days to fruit. For the first time, you may say – what is Garden Girl doing? I know, I know – plants should not be planted so closely together. If you are a purist, you are shocked! But you have to remember, I’m originally from New York City. I know how to do everything in cramped spaces. I am a small space gardener and so I have had to learn to be creative and think outside the box. My secret is using raised beds, lots of worms and livestock which create the best fertilizer for my soil. With this powerful soil mix, I can’t go wrong. Today, you will see me planting four different types of cucumbers in my raised bed. Telegraph Improved Cucumbers were originated in England and they grow to be 18” long! I am also planting Boston Pickling Cucumbers which grow to be only 7-8:” long and their thick flesh makes them perfect for…pickling, hence the name. The third variety of cucumber I am planting is the Suyo Long Cucumber that originated in China. Here you see me working with vining crops, this time Cucumbers. You will see the progress they have made in a short time. When I come out to look at the progress of my vining crops, I’m always looking for just a couple of things – that the plants are attaching themselves they way they should and that they are starting to flower and even show some signs of fruiting. As you can see with my cucumbers there are several small cucumbers starting to peek out and in one place a cucumber was starting to attach to my tomatoes and I had to gently re-direct them…vegetables are just like children! Well you never know what you’re going to find in the garden. You hope to find the fruits of your labors, or you may find what I found in my fruit orchards…that my little girl and her little friends like fresh fruit as much as I do! The blueberry bushes had fruited and today they are bare. At least the girls had fun! Although my dwarf Courtland Apple tree looks promising, they are not quite ready. I continue looking until I see the best news of the day – a huge ripe watermelon that will be saved for my husband’s birthday dinner. He’ll be happy. Watermelon can be grown in small spaces with a vertical support. This year I was able to grow a watermelon this is yellow inside and oh so sweet. The Harvest is kind of like Christmas and oh so fun! Come back and check out my third harvest adventure. This last part of my harvesting journey ends on a high note. I have found that my small exotic Asian eggplants that are green and downright dainty in size are ready! I can’t wait to make something special with them. My basil is also ready and I’m going to take it now before the rabbits get to it. Another surprise is that my Tiffen Mennonite heirloom tomatoes are also ready and - believe it or not, they are yellow! I can’t wait to get cooking. Thanks for watching and I hope your harvest season is as exciting and full of surprise as mine has been. Every garden has it's pests, and some are more talented than others! This little guy was found dancing across my zucchini leaves, and inspired us to take a closer look at this common garden pest. Snails are notoriously slow creatures, and are often very small. But donʼt be fooled, they can wreak havoc on the unsuspecting gardener, leaving your squash leaves looking like a lace doily in a matter of days. I am slightly obsessed with tomatoes. In fact, I grow about 25 different varieties of tomatoes each year. In this video, I am joined by my friend and fellow tomato enthusiast, Urban Gardener, William Moss. Check us out; we’re talking about the dos and don’ts of planting tomatoes. You don’t want to miss it. The most important thing to know about tomatoes is that they must be planted deeply. – The roots grow out of the stems and the root balls bring water and nutrients to the plant and so it’s critical that they are planted deeply enough to access all of the nutrients from the soil. Make sure to remove all of the branches that are going to under the soil. All areas of the stem can produce new roots - so don't worry. It’s always important to add compost to your soil and make sure that the compost contains calcium. How can they be related? If it’s late spring you may notice that gardener’s conversations have turned suddenly to potatoes and tomatoes. It’s that time again! What could potatoes and tomatoes possibly have in common? Nothing! Guess again, they’re actually cousins - both from the Night Shade Family and both native to South America. If you’re not an expert on vegetable families, your naked eye might notice the similarities in their leaves. After that, I’m afraid that’s where the similarities end. Watch while I plant potatoes in a 4X8 raised bed with melon, tomatoes and greens. Planting Potatoes is a unique experience, you'll be surprised. I'm going to plant Yukon Gold and Russet potatoes. You probably won't believe that this thing that I am holding is actually a potato seed, not a potato. A potato seed can grow a lot so you need to break up the seeds into sections. You will notice that potatoes have some holes in their skin. These holes are called "eyes." You need at least two eyes for each section that you are planting. I am not a competitive type, but I must admit that I was very curious to see how all of my gardening efforts were measuring up with others tomato growers. Size does matter, sometimes. I looked online and found that one of the largest tomatoes grown in the state of Massachusetts was 1.76 pounds. Although I never officially entered any competitions, I had a feeling in my bones that, unofficially, I could be a winner, too. With cameras rolling and you as my guests, we’ll go down to my garden to find the biggest tomato I’d ever grown. It’s massive. You’ll be impressed. I am very fortunate to be here with the President of Drip Works, Leon Springer who is going to spend the whole day with me, taking me through the multiple steps of installing a drip irrigation system. The second part of this installation is putting a drip system on my patio for my containers, which just entails putting a hole in the mainline and using a vary flow valve. The tubing will run up the side of the container. You will also need a pot dripper, which is a small gadget that goes right into the soil in the container. What living thing can you leave alone unsupervised and go on vacation? Your dog? No. Your kids? Definitely not. Your container garden? Yes you can! In this video, I’m going to take you step-by-step through the process of installing a drip irrigation system for your container garden. I love the weather-proof shine of galvanized metal containers! These simple vessels add an urban feel to my garden making it instantly chic and sophisticated. I have also found that these containers work perfectly for planting delicate edibles like Mint and Arugula. I leave them out on my patio and both grow back in the spring with no work from me! Surprisingly, metal containers like the ones you see here, are ultimately reliable in the New England winter and are actually better and much less expensive than terracotta or glazed containers, which need to be moved into the shed or garage when the weather gets too cold. If you don’t, they’ll crack. In this video, I am joined by Mark Highland, soil scientist and owner of Organic Mechanics a soil company. Take a look! One of the first misconceptions about container gardening is that you should only plant one item per container. I thought that too, but I was wrong! Container Gardening actually offers you the same flexibility that in-ground planting offers you. You just have to be mindful of similar water needs in order to plant a grouping together and you have to be mindful of soil lines, so you don’t smother your plants with too much soil. Perhaps it’s my Spanish heritage, or my love of peace, but for some reason I just love olives! The fact that they are a symbol of peace makes it a no-brainer for me to try to grow my own olive trees. Of course, living in New England, was going to be a problem for my peaceful gesture but I still was compelled to plant olive trees no matter where I lived. I did the research and found that it was possible with a little extra effort. Olive trees are grown best in zones 7-9. Living in Zone 6, which is where Boston falls, misses the mark, completely. However, what I did find was that it is possible to grow them in containers, which is right up my alley. I am adding blackberries to my container garden, and I am very excited. I am going to be planting Apache Blackberries. What's neat about these particular blackberries is that they are thornless. Unfortunately my timing is off. Had I started in April, I would have been seeing some blackberries as early as June. But since it is the middle of summer I will have to wait for my blackberries until next year. Proper spacing of your vegetable plants is one of the hardest and most annoying things to get right when you're trying to grow vegetables, especially when you're planting tiny seeds like carrots and lettuce. By making your own seed tape at home, you can get your kids involved in planting and make sure your seeds are spaced out correctly all at the same time. Homemade seed tape is a great project for me and my daughter to do together on a rainy day. All you need is some flour and water, toilet paper, paint brushes and seeds. Starting your won seeds indoors over the winter is a great way to save money, get stronger plants, earlier blooms, and a longer growing season. But what if you don't have a seed starting kit like my Hot House? There are lots of ways to start seeds using recycled household materials, and one of my favorites is using old cardboard paper towel and toilet paper rolls. Its a great way to recycle, and you don't have to transplant your sprouts from plastic pots in the spring, because you can just bury the whole tube in the ground! Join me for a fun moment with my daughter, Ale, aka the Garden Kid, as she shows you what her favorite part of gardening is: eating! She's going to show you how she picks blueberries and raspberries from my garden, which are her favorite snacks. Sometimes she can't even wait until they're ready to eat, and picks them before they're fully ripe. Today, she is preparing to make some cereal with fresh berries. Meet her at the pond, while she enjoys a peaceful and healthy breakfast. Her third today! Making newspaper pots is so simple that I explained it to my daughter, Ale, and she is going to show you how to do it. Newspaper pots are actually tin cans covered in newspaper. They are ideal and cost-effective containers for starting seedlings. As Ale shows you, all you need is some recycled tin cans, spare newspaper and tape. You attach strips of tape onto the cans and then add the newspaper by rolling it over the tape, and just folding under the loose ends at the bottom. Every season 35 million trees are cut down to accommodate the Christmas season. One tree has the ability to remove 48 pounds of carbon from the atmosphere. There are countless lessons to teach our children at Christmas time. In addition to this holiday not being about the gifts or material things, you can also teach them about how to make Christmas a time that we preserve our earth. You might be thinking, BORING – but just look at the video and see how much fun being eco-friendly at Christmas can be. 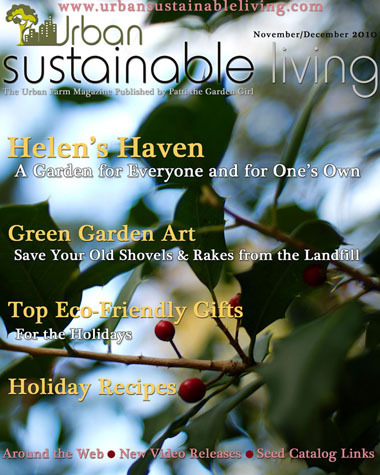 Favorite Holiday Gifts for Gardeners with an Eco-Friendly Twist! Re-produce, Recycle and Reuse is the key to holiday gift giving. Not only is today’s economy worse than ever, the importance of being eco-friendly is more than a buzz word, it’s crucial. This video offers you some wonderful ways to make the holiday season more bountiful than ever with more thoughtful and useful gifts. In this video, I show you what I plan to give, but I hope it inspires you to think specifically about your friends and loved ones. Think about what would be pleasing to them; less expensive for you and most earth-friendly. One of my favorite things about gardening is that it is something constructive and meaningful that I can do with my daughter. Today you will catch us in the garden at lunch time at the start of the summer. Alejandra and I are scanning the garden for salad makings and we have found several! Effortlessly, my daughter is learning her way around a garden. In my garden, we both spotted radish, peas, green beans, dill, basil and Kale! We are ready to eat! Today my daughter Ale, also known as the Garden Kid, and I are headed to New Hampshire to pick blueberries at Ale’s grandmother’s house. We’re psyched because there’s so much great stuff to get from her garden! We are very happy to find that the blueberry bush has grown into a virtual wall of blueberries and since it’s a high bush blueberry bush, it will conceivably grow from 4-7 feet tall. Ale and I have lots of fun picking these huge plump blueberries; many that we will take home and plenty that we eat right on the spot. In between pitching berries into Ale’s mouth and missing a lot, we talk about the benefits of blueberries and their abundance of anti-oxidants. Ale asks me what they are and I explain to her that they contain and element that helps fight the onset of disease. She wants more! What's great about wildflower seeds is that you really don't need to sow them in formal rows in raised beds like I do with my vegetables. There are a lot of creative ways to plant flowers in your yard, and one way is by making seed balls. Seed balls are basically seed clusters, held together by a clay soil medium, that you can throw wherever you want plants to grow. This method is great for wildflowers, decorative grasses, or even herbs, but I like to do it with a blend of many different perennial wildflower seeds, so I'll be able to enjoy them year after year. Seed Balls are really fun to make! You can make as few or as many seed balls as you want, as long as you keep your ingredients in the right proportions. This is simple and ultimately rewarding. You will see that I have a basket full of that gorgeous hair that I sheared from my angora rabbit. I am working with it by the handful only. I am working with two hand carders (brushes). The first time I run the wool over the carder to make sure the fibers are lining up. Then once the whole handful is on one carder, I use the other to transfer the fibers from one to the other. It is important to make at least three passes from one brush to the other. We do this to make sure the fiber has no vegetable matter, dirt, flecks of matter, etc…You just want the fibers to be as clean and pure as possible. Once you have transferred the fibers from one card to the other at least three times, I did it four times; the last hairs that are left on the empty card will not be used. It is best for the hairs to be at least 3” long – any hairs less than that will not work as well as I spin into yarn. All of the hair that is left on the other card, you are now ready to take it off of the brush and roll it up into a rollag. Did you know that you can make your own garments with your own hand spun yarn? You can because I do it all the time. Today you are finding me in the “Tiny House” which is my favorite place to spin yarn. It is a miniscule building on my property and I snapped it up as the place for me to do what I love…spin. The yarn that I spin comes straight from the animals that I have raised on my farm. Today, I’m working with Angora (rabbit) and Pygora (goat) fibers as well as Merino wool. I won’t say that what I am about to teach you is easy, but I will say that it’s totally worthwhile. It’s a rainy day and I am in my tiny house spinning again! I told you, it’s addictive. Today I’m working on making a one bobbin scarf which is unique because although I am using only one bobbin, I am able to combine several different types of fibers which will make a very unique handspun scarf that everyone will admire and you can tell them…it’s not available in stores! You see here that I am working with Merino and Pygora Fibers. I like to work with Pygora because, believe it or not, it is seven times warmer than wool. The only challenge of working with Pygora is that these goats have unique hair that includes “guard” hairs that have to be removed before spinning it into yarn. The angora fibers can be slippery, but they are super-soft and leave cloud-like puffs in your fiber. It’s unique and attractive. Look at it. I’ve come a long way baby! From a city apartment near the East River to shearing pygora goats on my urban farm in New England. What a difference a day makes. Today, I’m shearing my Pygora goat with my friend, Sam, who has been raising goats for nearly a decade. Today you're going to find out. I'm doing some exterior painting in my garden and milk paint is a special paint that does extremely well with unfinished woods. It is called milk paint because it is made from milk protein, and it soaks up color extremely well, finishing with a nice matte finish. It adds a rustic look to everything that it touches which is why it's so popular for those who know about it, and wood workers swear by it. Once your item is painted, with all the colors except for white, the paint shows water marks which makes your pieces look even more rustic and unique. This is a deliciously cool, refreshing drink that starts in the garden. Or at least it should. Fresh herbs look amazing in the garden and they taste even better in all of your favorite foods…especially Italian food. You probably guessed that I would say that. Today, I’m going to teach you a cool way to preserve your herbs for the whole year. Come with me….As you will see I have a delicious variety of parsley and basil. They are both a vibrant green and so aromatic that I just want to eat it all. Take off just the tops of the plants so they can continue producing. Then I take them into the kitchen and make sure that I have spices for the rest of the year. Shakers learned everything they know about staying healthy from Native American wisdom. Today I am going to show you how to make three holistic teas that have been keeping people free from common complaints for thousands of years. Be sure to ask your doctor before using these teas, especially if you are taking a prescription medicine. I am going to make three types of medicinal teas: Hyssop Blue, Feverfew and Bee Balm. Hyssop Blue is known for it's assistance for chest congestion and coughs. Feverfew prevents migraine headaches and should be drank daily as a preventative measure. Bee Balm helps with nausea and digestive issues. Welcome to "no-excuse gardening." In just 30 short minutes you can have an herb or vegetable garden, which will be an excellent first project if you are new to gardening. If you are a seasoned gardener, using Garden Soxx is just the perfect way to start something new, without spending too much time, because you probably don't have much free time as it is. Garden Soxx, which were originally designed for erosion control, have also become a new way to plant in small spaces, which makes them perfect for raised bed gardening. Garden Soxx are cleverly made from a synthetic fabric which is stuffed with 1 cubic foot of compost, and they will last from 3-5 years. If you ever thought you were scared of worms, now is the time to get over it. A worm bin is a perfect eco-friendly solution for anybody with a small patio or garden. It also is ideal for condo dwellers where there are rules and regulations against composting. The worm castings (or worm ‘poo’) make the best natural fertilizer, and its power can be extended by brewing up worm tea to apply when watering all your plants. Not only is your homemade compost great for your garden, it reduces waste in landfills by getting your kitchen scraps to work for you and your edible landscape. The Best Use for Fallen Leaves in the Garden? Make a Compost Bin! Compost tea works! I have seen it have miraculous results. Healing sick plants – now that’s my cup of tea! Hold the sugar. This is NOT your cup of tea. This is tea for your plants. In this video, I am joined by my friend Mark Highland of Organic Mechanics. You may have met Mark before, he’s my soil expert. Mark has spent most of his career researching soil and creating a unique blend of high quality soil that will do wonders for your garden. His unique blend includes compost, worm castings, coconut fiber, pine bark and perlite. The ratios of these ingredients are perfect after a decade of researching and getting it just right. The unique biology of the ingredients creates a sort of “Super food” for your plants. The macro pores produce a poly-saccharine that is sticky to the touch and works hard to retain the moisture in the soil, further nourishing your plants. I am joined here by my good friend and colleague William Moss to talk about one of my favorite topics, composting! As you know, composting is the environmentally safe way to improve the quality of your soil by using natural waste from your yard as well as kitchen scraps. It is the easiest way to be a responsible citizen of the earth. Compost is free fertilizer and an excellent soil amendment. William and I are using the simplest version of a compost bin which is 19 gauge hardware that comes in a roll. You can make a cylinder with it, as you see here, and use kitchen ties to bind it together. My first experience raising ducks wasn’t the greatest, but they sure were delicious. This year the family and I decided to try it again, but this time just for fun. Our big pond was just calling for wild birds. We raised them indoors starting when they were a day old. Soon we took them outside to walk around near the pond and they went into the pond. I find it so fascinating that they always stick together. What a great way to spend an early spring day watching the ducks. Welcome to another day in my life. Here you see what happens when I move my own chicken tractor to a new location to service a fallow bed that needs to be revitalized. If you caught the video where I built the chicken tractor (with my own two hands! ), now you can see it in action; the perfect place for protecting my chickens. The tractor is currently housing month-old Araucana chickens that have another month before they will start laying eggs. This is the perfect time for them to be working. I love my house, but I hate my soil! Urban gardeners are often met with less than desirable soil. But I’ve figured out how to work around that urban handicap. I’d like to introduce you to a few of my favorite friends – I call them “my A-Team.” They have the power to transform my less than great soil into Black Gold! I wake up extra early when I take a trip to the chicken processor. This time, you’re coming along with me as I prepare for a big party at my house and will have many mouths to feed. My Rock Cornish hens are in the back of my truck and I’m headed outside of Boston to leave them with the processor to be “processed.” At the end of the day, they will be ready for pick up packaged just like in the supermarket – but much, much better! First you’re asking what are Pawpaws? Believe it or not they are the largest fruit native to North America! They are a delicious fruit very common among Native Americans. The only reason you don’t see them in your local supermarket is that they don’t have a long shelf life making them unable to transport them. The disappointing thing about that is that Pawpaws are absolutely delicious and should be at the top of everyone’s grocery list! Pawpaws are most abundant in September and they are mostly found in the wild. They are actually berries and you will see them in yellow, green or brown as you see here. When pawpaws are brown it means that they are the ripest and most delicious! My Asian Greens are ready for harvest and tonight my family will have one of my favorite stir fry meals. It’s amazingly simple and tasty. My beef strips have been marinating overnight in Asian BBQ marinade which is easy to find in your grocery store. In my wok, I have oil, chopped garlic and shallots and am sauteing them. Once the garlic and shallots start to brown, it’s time to add the meat. Because the slices of beef are thin, it’s important that the meat doesn’t cook for too long. In fact, you must be careful not to overcook. Once the meat is cooked, you simply add the chopped up Thai Cabbage, Bok Choy and scallions into the wok. Stir them together so that the oil saturates the greens, wilting them, slightly. My Omelet d' Frommage is a quick and easy cheese omelet. I am sure you already know how to make an omelet, but what I am going to show you is how to make a spectacular omelet with garden fresh ingredients. Dazzle your next breakfast crowd. I am using my ceramic Flameware skillet on the stove., While most clay pots cannot be used on stoves, my flameware skillet is made out of pottery clay that is then fired at a high temperature allowing it to be stove ready. This is as traditional a dinner as it can get, but your family will adore it. I am making baked chickens with two Rock Cornish hens that I raised myself. The key to this recipe is to make it with fresh ingredients. I am working with a very traditional stuffing of bread crumbs, sautéed onions and celery and a host of other fresh herbs from the garden. Although it is a simple mixture, the freshness is what will make the flavor burst in your mouth. Today I am visiting with Uncle Ted who has been making syrup all of his life, because his father did when he was growing up. Some traditions are hard to break. When I arrive, Uncle Ted already has a maple tree tapped and the sap is already dripping slowly into the bucket. He says this tree has been tapped for about a week and it is still dripping sap. Uncle Ted lets me put in another spout and lets me use the crank to get the tap securely into the tree. My tomatoes are ripe and it’s the perfect time for soup! But not just any old soup, Garden fresh Gazpacho…And, it’s cold. Let’s take a trip through my garden and get all of the ingredients you need for this simply divine recipe. The first thing I see is Arugula one of my favorite greens. Actually, Arugula is an herb, it’s a wild plant that grows well and gives your salads a unique look and an interesting flavorful taste. It will go perfectly with your Gazpacho. Dolmades: is an Arabic term meaning "something stuffed." Dolma (stuffed vegetables) became "Dolmades" in Greece. Dolmades can be stuffed with a number of things to suit individual tastes. They are sort of like the Greek version of Burritos. Cultivating grapes takes time…a long time; three to four years, in fact! But once you make the investment to grow grapes, the rewards are endless. Their leaves are an added bonus that Greeks have known about for centuries. My neighbors’ Greek grandparents come to visit every year and they always get their grape leaves from my farm to make Dolmades. I'm treating myself to lunch today. First, I'm starting by hand picking my fresh lettuce straight out of the garden. Wait until you see how much money you are saving by making this restaurant-style lunch right at home. Did you know that in addition to the fabulous vegetables that squash, zucchini and cucumbers plants bear, they also bring flowers? And, the flowers are completely edible! I am in my French Kitchen Garden Raised Bed and I am admiring how plentiful my squash are this season. Because I don't believe in wasting anything, I am going to show you a recipe that utilizes these tasty squash flowers. Come inside and be prepared for a delicious snack or an elegant appetizer. Squash flowers are a rare treat because the squash flower ony lasts one day. They must be picked at dawn and placed in a bowl of cold water in the the refrigerator and use the same day. I have most of the makings of this awesome salad right here in my Asian Greens raised bed. To make this salad, I will harvest Thai Cabbage which is not your typical cabbage. Thai Cabbage does not grow as a "head," it is actually individual thick leaves that have a thick core in the middle that is easily removed. Watch how I do it. For the salad, I will use about three leaves of cabbage, Thai basil and cilantro. Herbs are good for more than just cooking. You can also use fresh herbs to flavor some delicious homemade cocktails. In this video, Iʼm going to share with you my recipe for a sage martini with apple. Another way to put a garden-fresh twist on a classic cocktail recipe is by making thyme lemonade. This unique and refreshing drink is easy to make, and an instant hit.